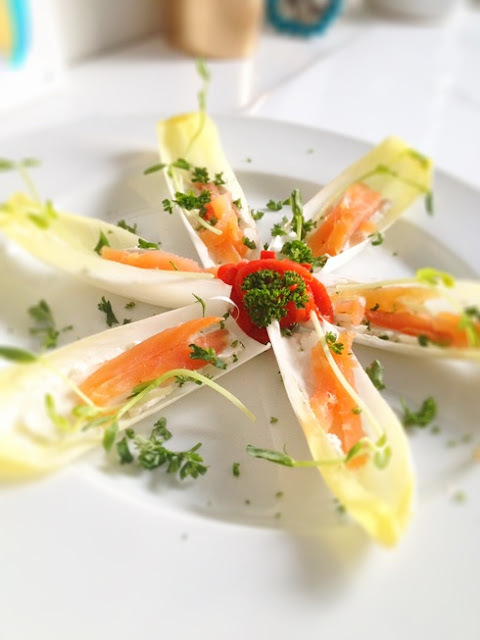 Endive is always a good base for making a great looking, quick appetizer. Here several leaves are cut from the head and washed carefully. Discard the outer ones and go for the inner ones - the flavor is more delicate and the edges are still stiff. Use a soft cream cheese like neufchatel, or in this case tofutti cream cheese. Spread a small bit inside the base of each leaf. Then top it with a few cut strips of smoked salmon. The cheese can be flavored - maybe add some chopped scallion or chives. No salt - the salmon is already strong enough. Arrange neatly on a plate - a star configuration is a nice presentation - then add a bit of garnish to make it pop. Yay for your food blog!!! !